Meeting was called order at 7:39 p.m. by President Lori Maracle. Minutes from the January 2013 general meeting were accepted as read. Betty Ballanger made the motion to accept, and Vel LeVatte seconded. All were in favour. Kim read the treasurer’s report. Balance forward from last month is $3056.90. Income was $1343.30, and expenses were $114.50 leaving us with a balance of $4285.70. GIC certificates total $3000.00 and petty cash is $100.00. Lori spoke to the membership about our upcoming “Tripartite” meeting with the BIA (Business Improvement Area) and the Chamber of Commerce. The meeting will help with planning the beautification of the downtown area, and by the three groups meeting together it eliminates overlapping work and expense. Lori also spoke about the upcoming Home & Garden show that takes place in April. The dates are April 19th and 20th. Setup day will be Thursday, April 18th. Our booth has been reserved and volunteers are needed both for setup and for manning the booth during the show. A sign up sheet was passed around. Debbie Thomas spoke about the upcoming bus trip to Canada Blooms/Toronto Home Show. Tickets are $40 for members and $50 for non-members. The bus leaves Dunnville on March 23rd at 8:30 a.m. and returns approximately 6:30 p.m. The format is the same as last year. We will not have a regular June general meeting. Instead, we will be meeting at Rosa Flora for a special guided tour of the facility. The cost is $5.00 per person and is open only to members. Afterwards we will gather at the home of Rob and Lori Maracle for a BBQ. Kim spoke about the upcoming District 9 Spring Forum that we are hosting in April. District 9 encompasses the Niagara Peninsula from Grimsby to Niagara Falls, and also includes Dunnville, even though we are physically located in Haldimand County. This will be a great opportunity to show off our society and our town. A meeting will be held at the Chamber of Commerce on Tuesday, March 19th at 7:00 p.m. If any members are interested in helping out, either with making sandwiches, snacks, setting up, etc., please attend. All are welcome. There will be a flower show at the spring forum in which members are encouraged to enter. Kim will have entry forms at the March meeting. The rules for the flower show are on our website (www.dunnvillehortsoc.gardenontario.org). Debbie Thomas introduced our guest speakers, Shawn Nixon and Chris Paribello from Davey Tree Expert Co. of Canada. They talked to us about pruning basics and gave a great presentation. Steve Elgersma won the 2013 Early Bird Draw and was presented with a $25 gift certificate from Harmony House Jewellers. The Ways & Means draw raised $52.00. Thank you to Betty Ballanger and Debbie Wilson for a job well done. 41 Members were signed in. Head count was 44. Please remember to sign in each time you attend. Meeting was adjourned at 9:35 p.m. Thank you to all the volunteers who made tonight meeting a success! Feb 2013 happy Groundhog Day! Wiarton Willie did not see his shadow today so we’re going to have an early spring. How exciting! I can’t wait for this cold and snow to be over. I am not a winter person, having never been into outdoor sports such as skiing, or skating. I love the anticipation of a new spring garden so the sooner it’s gone the better. I can’t wait to see the first crocuses and daffodils that peek up when the days start to get warmer. If you have a perennial garden as I do you know that each year brings surprises as to what is going to appear in your garden. So I guess it’s good that we do have winter in order to have a reprieve from our gardens and have that special feeling that you get when our favourite plants decide to return. The old faithfuls come back every year, but occasionally something will appear that is a mystery. Occasionally it’s a weed, but I won’t pull it out until it flowers and I know for sure. 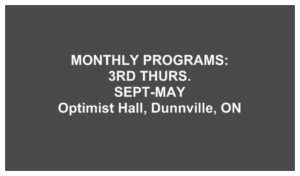 We have a very busy year ahead of us as President Lori Maracle and Vice-President Debbie Thomas explained at the general meeting last month. We are planning another bus trip to Canada Blooms again this year. Last year’s trip was a huge success and everyone had such a good time, on the bus and at the show. The show runs from March 15-25th at the Direct Energy Centre in Toronto. It coincides with the Toronto Home Show again this year so there will be lots to see throughout the day. The exact date hasn’t been booked yet so we will update you as soon as we have it confirmed. We are also going to plan a bus trip to the Royal Winter Fair in Toronto. This year it runs from November 1-10th and because of huge crowds on the weekends we will likely be going on a weekday. Again, once the date has been confirmed we will let you know. The Dunnville Home & Garden Show will be held again this year in April and we will be attending. Our booth garnered a lot of attention last year, and our volunteers who manned it signed up a number of new members and raised money by holding a couple of raffles. If you have some time that you could donate we could use volunteers again this year to help out. Please let Lori Maracle know if you are interested. We will be holding many of our regular activities again, such as our May plant sale, and our Garden Walks. We will also be participating in the Mudcat Parade again. Pam Blanchard did such an amazing job of organizing our entry last year and we can hardly wait to see what she has planned for this year. We are going to try a few new things this year with our “information packages” that you get at each meeting. 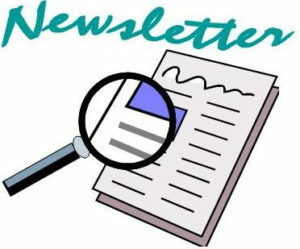 Minutes from the previous month, the newsletter and upcoming events will be emailed out to as many members as possible so you will have a chance to read it before the meeting. Hopefully this will help to speed things up with voting on the minutes and with keeping our printing costs down. Please make sure that we have your current email address and needless to say you can rest assured that any personal information that you provide to us is kept strictly confidential. If you have any questions or concerns please let me know. If you have access to the internet you must visit our website. There’s a plethora of garden related information and links to other websites and catalogues. Visit www.dunnvillehortsoc.gardenontario.org. Our mandate, our upcoming projects and contact information is all listed here. There are photos of past Trillium award winners and many of our other functions, as well as newsletter and minutes archives. Our guest speakers for February are “Davey Tree Experts” Shawn Nixon and Chris Paribello. They are both arborists and are going to explain the fine points of pruning. Most trees require pruning during dormancy so this is a well-timed lecture and will give the much needed guidance to trim our trees and shrubs in the early spring. Garden Tip of the Month: Start parsley indoors now. You may think you have successfully wintered over the plant, but it is a biennial and will soon go to seed. You can start some perennials now, including delphinium, and carnation. Start some annuals, especially those that have slow growth, including marigolds, impatiens, pansies, snapdragons, and petunias. Don’t forget winter birds! Put out water, seeds, and suet. Keep your feeders clean and squirrel free if at all possible. See you at the meeting.